Below is a list of dyslexia terms and related dyslexia facts found throughout our website. A few terms and definitions may appear here and not elsewhere on our site since we can't produce pages fast enough! Accommodation: Changes in the method or duration of instruction or testing that allow a student to demonstrate what they really know. Accommodations can include extra time, change of location, having questions read or presented in a different media (visual, audio, tactile) and use of technology such as a lap top instead of pen and paper. Accommodations do not lower the expectations or level of skill being tested. Acquired Dyslexia: Dyslexia resulting from trauma, injury or disease to the parts of the brain that control reading and writing. For example, this can be the result of a tumor, stroke or Alzheimer's disease. Assistive Technology: Technology that supports any activity including physical movement, reading, writing, spelling and mathematics. Attentional Dyslexia: A 2010 Israeli study found a new type of dyslexia being called 'Attentional Dyslexia' in which children can identify letters correctly, but the letters jump between words on the page. "kind wing" would be read as "wind king." The substitutions are not caused by an inability to identify letters or convert them to sounds, but instead result from the migration of letters between words—the first letter of one word switches place with the first letter of another word. Attention Deficit Hyperactivity Disorder (ADHD): ADHD is a chronic condition relating to both the ability to focus attention and to gross motor activity. It includes a number of behavioural elements including difficulty sustaining attention, hyperactivity, impulsive and inattentive behavior. Auditory dyslexia: Auditory dyslexia involves difficulty processing sounds of letters or groups of letters. Multiple sounds may be fused as a singular sound. For example the word 'back' will be heard as a single sound rather than something made up of the sounds 'b' - 'aa' -'ck'. Comprehension Deficit: Poor understanding of what was read. Deep Dyslexia: Deep dyslexia is distinguished by two things: Frequent semantic errors (reading table for chair) and extreme difficulty reading nonsense words. Typically, it is an acquired form of dyslexia, meaning it arrives later in life, . It does not usually result from genetic, hereditary (developmental) causes. It represents a loss of existing capacity to read, often because of head trauma or stroke that affects the left side of the brain. Decoding: Interpretation of meaning from symbols, words, and sentences. 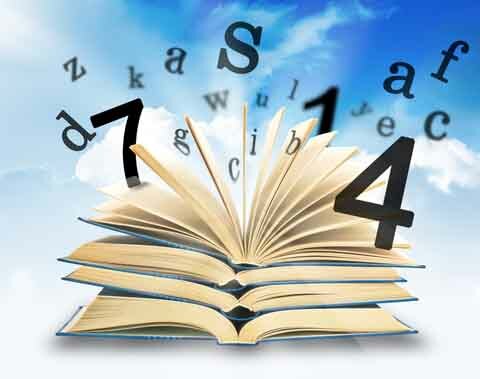 Developmental Dyslexia: Developmental dyslexia is not so much a type of dyslexia, it is dyslexia.In fact our definition of it would be the same as our general definition of dyslexia: Extreme difficulty reading caused by a hereditary, brain-based, phonologic disability. Directional Dyslexia: Extreme difficulty distinguishing right from left and following a sequence of directions or retracing a path. Not really a form of dyslexia, since it does not involve words. Dyscalculia: Extreme difficulty learning or comprehending mathematics/arithmetic. Sometimes it is referred to as math dyslexia. It often occurs together with dyslexia, dysgraphia and attention deficit disorder (ADD), though it is a separate learning challenge. Dysgraphia: Difficulty writing, or very messy writing, that is often illegible and incomprehensible, caused in part by weak fine motor skills and difficulty memorizing sequences. It is a specific learning disability, distinct from dyslexia and attention deficit disorder (ADD) but often occurs together with them. Dyslexia: Extreme difficulty reading caused by a hereditary, brain based, phonologic disability. Dyseidetic Dyslexia: Difficulty processing words into sounds. The weak use of 'sight words' forces the dyseidetic reader to sound out every word. Sometimes called visual dyslexia, it is a relatively rare form of dyslexia, usually acquired later in life. Dysphonetic Dyslexia: Difficulty processing sounds into words. Results from difficulty remembering sounds and manipulating/ blending them into words. Sometimes called auditory dyslexia. This is the most common type of dyslexia and is hereditary & developmental. Fluency: The ability to smoothly articulate sounds for meaningful words and sentences. Irregular words: Words which do not have normal and established patterns of sound and spelling and which are read as single units rather than as a combination of sounds and letters. For example, 'said' or 'yacht'. Math Dyslexia: Math dyslexia or 'dyscalculia' is a specific learning disability characterized by an extreme difficulty performing mathematical operations. Multisensory Teaching: Involve regular interaction between the teacher and the student and the simultaneous use of multiple senses including auditory, visual, tactile and kinesthetic (movement). For example, a dyslexic learner is taught to see the letter A, say its name and sound and write it in the air—all at the same time. The use of multisensory input is thought to enhance memory storage and retrieval. Orton-Gillingham approach: An approach to reading instruction for dyslexic students developed by Samuel T. Orton (1879-1948) and Anna Gillingham (1878-1963), early pioneers in reading and language mastery. The approach is described as language-based, multi-sensory, structured, sequential, cumulative, cognitive, and flexible. Many modern reading systems are based on it or incorporate key elements. Over-learning: Repetitive practice beyond mastery to enable effortless use of skills. Phonological dyslexia: Extreme difficulty reading that is a result of phonological impairment, meaning the ability to manipulate the basic sounds of language. This type of dyslexia is synonymous with dyslexia itself. Phonological deficit: Difficulty decoding or assembling words based on their sounds. Phonemes: The smallest units of speech sound that can convey a unique meaning. They consist of consonants, long and short vowels, digraphs and other sounds. Each language has its own unique set. In English there are 44 sounds. (A) In general.--The term `specific learning disability' means a disorder in 1 or more of the basic psychological processes involved in understanding or in using language, spoken or written, which disorder may manifest itself in the imperfect ability to listen, think, speak, read, write, spell, or do mathematical calculations. (B) Disorders included.--Such term includes such conditions as perceptual disabilities, brain injury, minimal brain dysfunction, dyslexia, and developmental aphasia. (C) Disorders not included.--Such term does not include a learning problem that is primarily the result of visual, hearing, or motor disabilities, of mental retardation, of emotional disturbance, or of environmental, cultural, or economic disadvantage. Speed/Naming Deficit: Slow reading; poor use of sight words. A sight word is a word that is instantly recognized by the reader; is not sounded out, and requires almost no effort to understand. Surface Dyslexia: A kind of dyslexia defined by difficulty recognizing and spelling whole words.Someone with this type of dyslexia may be able to sound words out well, even nonsense words, but they cannot read or spell words that have irregular spellings such as 'colonel' or 'debt'. For more dyslexia facts, try our dyslexia Fast Facts page.